OAKLAND PARK – In today’s busy world, clergy and lay members alike may think the last thing they have time for is to take a walk. Rev. Juana Jordan, senior pastor at Harris Chapel UMC near Fort Lauderdale, initially thought so. Appointed to lead a congregation she described as “in transition,” she was looking for ways to stoke the fires and develop church leadership when she first met South East District lay leader Mike Sullivan, who encouraged her to sign up for a Walk to Emmaus weekend. "Our people are becoming more of a disciple from this experience than any other work we have done in our church." Now, a year after Harris Chapel began sending members to the lay-led retreat developed by The Upper Room ministry of The United Methodist Church, the pastor has discovered that the walk she initially saw as a luxury respite can be a path to spiritual renewal. In the past 12 months, Harris Chapel has sent 19 participants on the Emmaus journey, and Jordan believes the experience is transforming the entire congregation. “The men came back energized; the women were with a deeper sense of their own call, what their own walk with Christ means,” she said. Results like that come as no surprise to Sullivan. A self-described “apostle for Emmaus,” Sullivan has sponsored more than 250 others on the retreat, spearheading Emmaus in Trinidad, Barbados and Dominica, as well as promoting Chrysalis, the program’s student version, in Trinidad. He has assisted with walks in Cuba and the Bahamas, and he is active in the Oceanside Emmaus of South Florida while also serving as the ministry’s assistant regional representative for the Southeast Jurisdiction of The UMC. Retreats are conducted virtually every weekend all around the world by various “communities” of Emmaus volunteers. According to The Upper Room website, the three-day Emmaus retreat follows a structured series of talks by laity and clergy on the subject of God’s grace and how Christians can share it with others, interspersed with prayer, song, worship and small-group participation. Although Sullivan promoted the Emmaus experience when Jordan sat next to him during a meeting of their district’s Committee on Congregational Vitality, it took an extra push for her to make time for the program. In the spring of 2012, Jordan and a group of Harris Chapel leaders went to a workshop conducted by Rev. Harold Lewis Sr., then director of the Black Church Office for the Florida Conference. Lewis cited the Bible account of how God told a discouraged Peter that God was preparing others to help him. • The “Bountiful Blessings” food pantry took off, growing from serving perhaps 12 people a week to 50 or more. Now the ministry has outgrown the space. • An Emmaus “pilgrim,” Vernon Dooling, began “Agape Fellowship” after worship, serving refreshments and welcoming visitors. He also began packing “hope bags” with toiletries that he gives to homeless people, praying with them on the spot and jotting down their names to add to the church’s prayer list. • Individuals in the congregation experienced personal growth. Members of Harris Chapel UMC, Oakland Park, say they found spiritual renewal through participation in a Walk to Emmaus retreat. 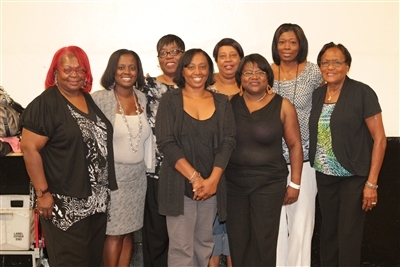 From left, Esther Onenation, Carla Mitchell, Carol Parks, Sinda Henry, Lisa Hamm, Mazuria Powell, Katrina Beasley and Gloria McKay are among those who participated in an Emmaus retreat in the last year. Photo by Dave Walter. For example, Bryan Beasley, a police officer who attends Harris Chapel, said the demonstration of God’s love at Emmaus gave him a greater sense of purpose and desire to serve others. He noted that he deals every day with people struggling with broken lives. He and his wife, Katrina, said the experience also helped their marriage, fostering a renewed commitment to serve family members and others. 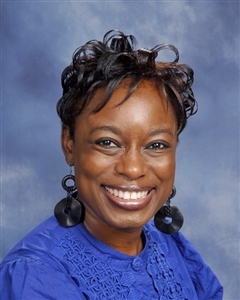 Katrina Beasley is working on a plan to partner with local schools to provide backpacks of food children can take home over the weekend and has a vision for an adult day care ministry at Harris Chapel. Today, as Harris Chapel prepares to celebrate its second half-century of ministry, the church’s Emmaus alumni are meeting in “Reunion Groups” for fellowship and encouragement. They have taken on leadership roles as trustees and ushers and outreach organizers, and they are volunteering to serve on future Emmaus Walk teams and encouraging teenagers to experience a Chrysalis weekend. “This is putting discipleship into action,” Jordan said, adding that she believes Emmaus spurred Christian growth that otherwise might have taken years. Conference Lay Leader Russ Graves, a Walk to Emmaus alumnus, sees the concepts as essential to growth as a disciple of Christ and to fostering Christian leadership. There are 13 Emmaus communities in Florida. Check The Upper Room website for the list, schedules and contacts for more information. -- Rev. Bob Wannall is a freelance writer from Ocala.